When we walk by faith and not by sight (2 Cor 5:7), the invisible becomes visible (Heb 11:1) and we can focus on the things not seen, the eternal things of God (2 Cor 4:18). Faith enables us to call heaven down to earth, the manifestation of God's Glory. 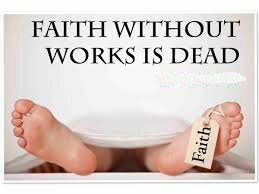 Hebrews 11:6 tells us that without faith it is impossible to please God, while James 2:17 tells us that faith without works (exercising faith) is dead faith. God's obviously not interested in dead faith, which means that merely 'having' faith means nothing to Him without demonstrating that we have it. We demonstrate that we have faith by exercising it (doing works). In order to please God we must exercise faith in doing the work of God while on earth. To exercise faith means putting it into action - doing something. Go do something today.